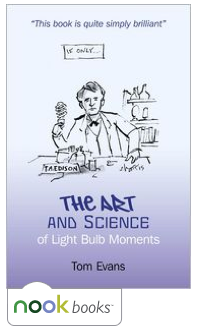 I am doubly thrilled that my new book, The Art and Science of Light Bulb Moments, has now made it on to the Nook platform just after becoming available on the Kindle. What’s even more pleasing is how many places my publisher Obooks have made the book available. It’s taken a year but it is definitely worth the wait and it’s a joy just to have been able to write and for all this to happen around me. Book Depository plus a nice review too ! !